A barbed assault on the pretentiousness of the Factory Records / Haçienda scene. Ian Brown was the dominating lyrical influence in The Stone Roses' earliest work, before the classic Squire/Brown partnership that would yield the 1989 eponymous debut LP. While Squire brought an artistic vision to the band, Brown introduced a religious flavour to their work. In the nicknames given to the rhythm section of the band, one could locate this synthesis: (Guido) Reni meets Mani (Manichaeism) ! Wanting to release Jesus, Pilate appealed to them again. But they kept shouting, "Crucify him ! Crucify him !" For the third time he spoke to them: "Why ? What crime has this man committed ? I have found in him no grounds for the death penalty. Therefore I will have him punished and then release him." From the four Gospel accounts, we learn that the crimes of Barabbas were murder and insurrection, and not thievery. Matthew (27: 16) refers to Barabbas only as a "well-known prisoner". It is interesting to note that the name Barabbas means son of the father ("bar" = son, "abba" = father). The true Son of the Father stood before them, but the crowd instead chose to free another. Two other men, both criminals, were also led out with him to be executed. When they came to the place called the Skull, they crucified him there, along with the criminals - one on his right, the other on his left. Jesus said, "Father, forgive them, for they do not know what they are doing." And they divided up his clothes by casting lots. The people stood watching, and the rulers even sneered at him. They said, "He saved others; let him save himself if he is God's Messiah, the Chosen One." One of the criminals who hung there hurled insults at him: "Aren't you the Messiah ? Save yourself and us !" But the other criminal rebuked him. "Don't you fear God," he said, "since you are under the same sentence ? We are punished justly, for we are getting what our deeds deserve. But this man has done nothing wrong." Jesus answered him, "Truly I tell you today, you will be with me in paradise." The rebel on the left of Christ wanted to be taken down; the rebel on His right wanted to be taken up. To the penitent rebel, it was promised that his soul instantly on leaving the body would be in the state of the blessed. 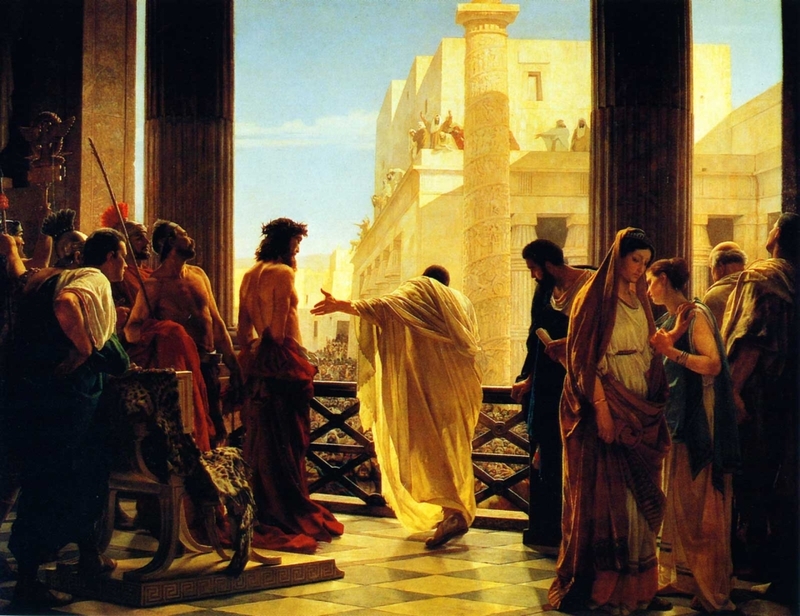 Top: 'Ecce Homo' (Behold the Man !) by Antonio Ciseri. Pontius Pilate presents a scourged Jesus of Nazareth to the crowd. 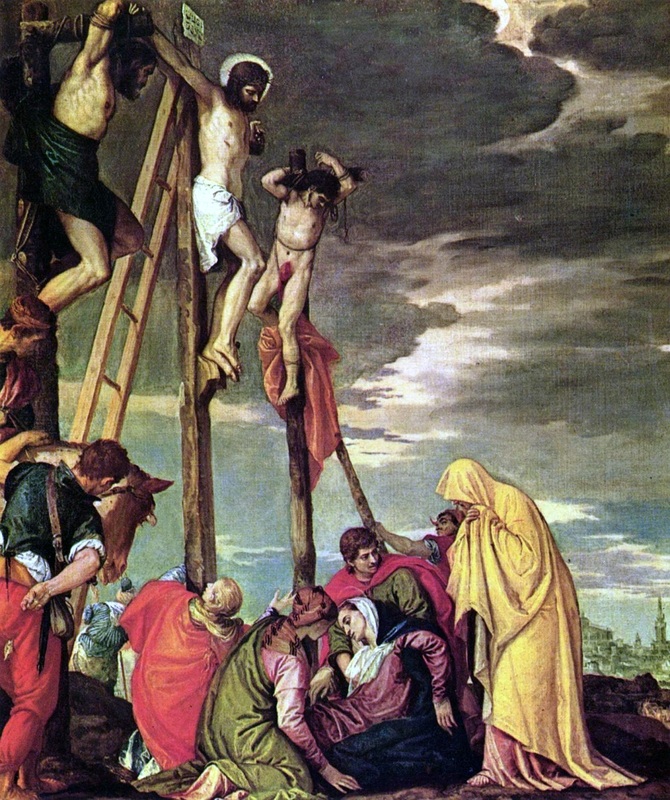 Bottom: 'Calvary' by Paolo Veronese.